The regeneration of a north-east town has taken another step forward with the search underway for designers to take on a £50,000 project. Aberdeenshire Council wants to appoint a specialist team to come up with blueprints for spaces for outdoor sculptures and an upgrade for new paving for Fraserburgh’s Kirk Brae area. It would mean the pathways outside the new Faithlie Centre would be completely revamped. Work on the conversion of the former council chambers into a centre for start-up businesses ground to halt in November after the main contractor went into administration. Local authority officials are currently drawing up a fresh contract so the transformation effort of the B-listed building can resume. Documents submitted alongside the proposals for the Kirk Brae upgrade set out what the council hopes to achieve. A report said the materials used for the upgrades should be suitable for the town centre and the Faithlie Centre itself. It said: “The Kirk Brae public realm improvement project should not be regarded as a scheme in isolation, rather it should be seen as the initial part of a strategy for improving the whole town centre area. “Therefore the scheme design and material specification should be developed to potentially extend to the whole town centre area as future opportunities arise. It also said that spaces for public art and sculpture should also be considered by potential contractors. Brian Topping, town councillor and chairman of the Fraserburgh regeneration development partnership, welcomed the move. The project comes under the Fraserburgh 2021 regeneration scheme. A council spokesman added: “The intention is to upgrade the paved area adjacent to the new Faithlie Centre, as part of wider work to enhance this part of the town centre for the benefit of the local community, visitors and businesses. “We are aiming to commission design consultants to start work on the detailed design, then take the project to construction stage. The Fraserburgh 2021 Regeneration Scheme is a £5million project aimed at revitalising the town centre. Major upgrades of historic buildings dotted around the port have already been carried out under the initiative. A £1million development of the council chambers and former police station has been planned. The Faithlie Centre is being transformed into a new face for the local authority and will include a new facility for budding entrepreneurs. 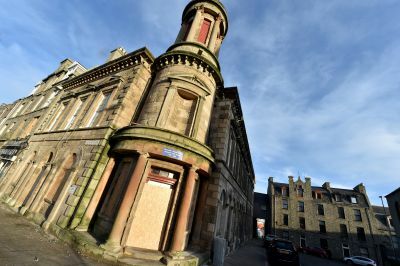 The North East Scotland Preservation Trust is behind a scheme to convert the derelict John Trail bookshop building into a hotel. It has lain empty since a fire a decade ago, but the trust wants to bring it back into use as part of a £550,000 revamp. The Fraserburgh 2021 group chose the old Penny Schoolie as the first property to be restored with funding from a regeneration grant. The building is now part of the Old Parish Church Centre on the High Street and work started on it in November. The award-winning Nooks and Crannies cafe was handed a grant to give its shopfront a facelift. The eatery was fitted with new windows, doors and signage created by the use of traditional joiner work, glazing techniques and materials.